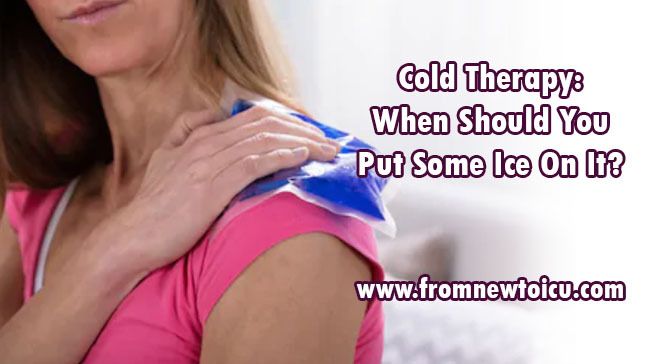 When an area of the body experiences a cold sensation from the local application of an ice pack, for example, the natural reaction is for the blood vessels to constrict and immediately reduce blood flow to the area. Cold receptors on the skin stimulate the sympathetic nervous system which triggers this blood vessel shrinkage also known as vasoconstriction. At the same time, cold application also numbs nerve endings, slowing the conductivity of motor and sensory nerves, and blocks pain receptors, It additionally suppresses the metabolic activity of the immediately surrounding tissues reducing enzymatic activity. These processes help relieve feelings of pain and discomfort as well as prevent hypoxia that could damage the tissue. Because the local application of cold does all these unique things in the body, the rationale for its widespread use is formed in the context of effectively reduce swelling (edema), diminishing pain, controlling hemorrhages, and easing inflammation. Acute musculoskeletal injuries - the mild to severe swelling, pain, and inflammation that occurs right after a musculoskeletal injury like a strain, sprain, or fracture can be aided by cold application, especially if it is administered right away. In addition to narrowing blood vessels to decrease blood flow to the area, cold application can also relieve lymph congestion that contributes to swelling. Muscle spasming and contraction - the type of pain associated with muscle spasms and contractions can be alleviated temporarily by cold application. A patient experiencing lower back, shoulder, or neck pain can apply an ice pack to sore muscles which helps numb the area, reduce muscle contraction, and reduce peripheral swelling. Post-surgical intervention - surgeries like tooth extractions, knee surgeries, and even major abdominal surgeries can leave a patient with excessive pain and swelling. Cryotherapy can help reduce swelling and slow nerve conductivity to diminish pain signals being sent back to the brain. In one 2014 study, ice therapy even reduced the number of narcotics abdominal post-op patients took to address their pain. Reducing high body temperature - fevers can become dangerous when the internal body temperature exceeds safe parameters. Cold therapy in the form of a cool or lukewarm bath or a cold, wet compress or ice pack on the forehead or back of the neck can help reduce the body’s temperature and keep it from climbing too high. Limit duration of application - prolonged exposure to cold application can result in an inadequate nutritive exchange to the affected tissue leading to hypoxia and tissue damage. Excessive cryotherapy can additionally cause muscles to tighten further and have a reverse effect on inflammation. Ice packs that are too cold or not applied properly can lead to frostbite. Monitor patient reaction - keep a close eye on the patient’s skin and remove the ice pack if skin appears spotty, white, or the patient complains of numbness or burning. Note too that reduced blood flow to the tissue receiving cold application can increase blood flow elsewhere and may cause, for example, nose congestion. Check doctor’s orders - typically, cold therapy is executed for 15 to 20 minutes at a time depending on the condition or injury. For an acute musculoskeletal injury, cold application may be repeated every 2 hours as well. Double check doctor’s orders and document in detail the treatment, the duration, the patient’s reaction, and the effect. Practice safety - if the patient has had surgery or has an open wound, wear gloves during cold application to prevent accidental cross-contamination and infection transmission. Dispose of gloves properly following application and wash your hands before continuing your work. Additional methods of cryotherapy that you may encounter in nursing include the use of hypothermia blankets, particularly during surgery, cold humidity to aid breathing disorders, and tepid sponge baths to decrease body temperature.